LAS VEGAS: An "intelligent" toilet that opens when you approach it and self-cleans with every flush is on display at the Consumer Electronics Show in Las Vegas. It also cleans the user with an aerated wand, which delivers warm water and warm air "from a seated position", a spokeswoman said. Despite a $9,800 (£6,704) price tag, more than 40 million earlier versions of the Neorest toilets have been sold. Bathroom firm Toto said the new prototype was still in development. Its self-cleaning process uses a combination of a disinfectant and a glaze - made out of zirconium and titanium dioxide - which coats the bowl. 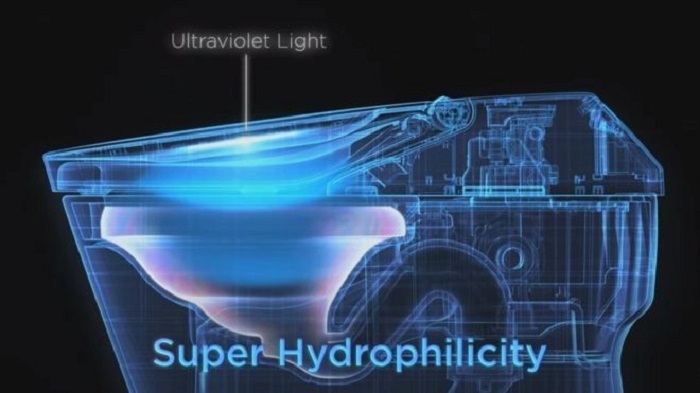 "Once it flushes it sprays the interior of the bowl with electrolysed water," explained Toto spokeswoman Lenora Campos. She said the "proprietary process" essentially turns the water into a weak bleach. "This bleaches the interior, killing anything in the bowl," said Ms Campos. Meanwhile an ultraviolet light in the lid charges the surface. That makes it super-hydrophilic - or water-loving, so nothing can stick to it - and also photocatalytic, enabling oxygen ions to break down bacteria and viruses. "You don't have to clean the toilet bowl for over a year," said Campos. The BBC asked several of Las Vegas' hotels if they might be interested in such a product, but all declined to comment. However, one smart home expert said the device proved there was still space for innovation beyond hooking things up to the internet. "It illustrates the notion that tech breakthroughs involve rethinking things," said Frank Gillett from the tech consultancy Forrester Research. "It's not necessarily about adding anything new." Potential purchasers should be warned, however, that the device does not totally absolve them of toilet cleaning duties since its cleansing techniques do not extend to spills outside of the bowl.